The HIV-1 RNA test checks for the presence of HIV-1 RNA in the blood. What is an HIV-1 RNA test? The HIV-1 RNA test is a blood test that is considered an early detection test for HIV-1. Why is an HIV-1 RNA test important? The HIV-1 RNA test can detect HIV-1 as early as 6 days after an infection. It is useful as an early detection test for people concerned about an HIV exposure. This HIV-1 RNA Test is a blood test. The HIV-1 RNA test, sometimes known as an HIV-1 early detection test, checks for HIV-1 RNA in the blood. The HIV-1 RNA test is known as an early detection test as it checks for HIV-1 genetic material known as RNA, or ribonucleic acid. This particular lab test uses the APTIMA® HIV-1 RNA qualitative assay, an FDA-approved nucleic acid amplified test (NAAT), to determine results. At present, this HIV-1 RNA test is the only RNA NAAT (nucleic acid amplification testing) assay to support the CDC HIV testing guidelines. The HIV-1 RNA blood test is sometimes used in addition to the standard HIV test and is part of the STD early detection test panel. To get an HIV-1 RNA test near you, just order online and get your blood drawn at the Quest Diagnostics lab that you selected. Once your HIV-1 RNA lab report is ready, it will be available for electronic download. As can be seen on the sample report link provided, the HIV-1 early detection test results are reported in a qualitative manner. In other words, a negative test result will be reported as not detected as opposed to reporting a number. 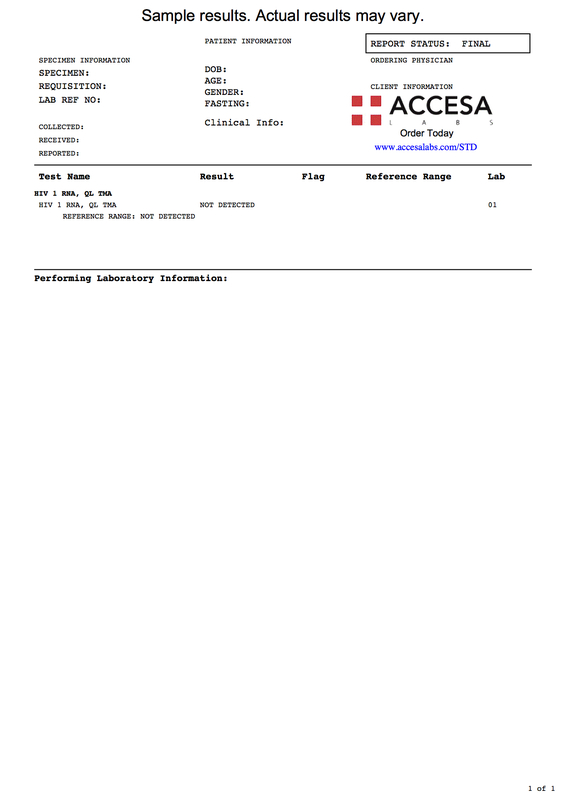 This HIV-1 RNA blood test uses a transcription-mediated amplification (TMA) methodology to check for HIV-1 RNA. The TMA methodology uses different enzymes to generate a DNA copy of any RNA detected and then it makes copies of the DNA to make it detectable. According to the manufacturer, the specificity of the Aptima® HIV-1 test was 99.83% and the sensitivity was 100% in the studies used to validate this HIV early detection test. Not only is the HIV-1 RNA blood test helpful in checking for a new HIV-1 infection, it is also useful in confirming a positive HIV-1 screening test and to resolve an inconclusive HIV-1 western blot. HIV-1 RNA Test at Guaranteed Prices.